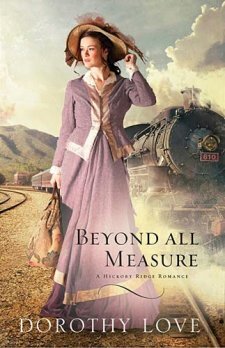 Beyond All Measure by Dorothy Love is a wonderful book about a young woman from Boston who finds herself in Hickory Ridge Tennessee in the years following the Civil War. In the summer of 1871 Ada Wentworth has no family, no home, and no money to her name. Ada accepts a position as a lady's companion for the elderly Lillian Willis, aunt of the local lumber mill owner, Wyatt Caldwell. Ada plans to save up enough money to establish her own hat shop with the millinery skills her mother taught her. With unanswered questions from her past, Ada is guarded but finds herself drawn to Wyatt, a Texan with big plans, and Sophie, a mulatto girl who lives at the local orphanage. The problem is that Ada's friendship with Sophie attracts attention from some townsfolk who want to displace Two Creeks, a settlement of "colored" men and women at the edge of town. Tensions rise but Ada is determined to help Sophie. When Lillian passes Ada is left without employment or a home. And now that his aunt has passed Wyatt is free to return to Texas to start his dream of owning a ranch. Can Ada let go of her past and trust god with her future? Can she let go of the betrayal of another to trust Wyatt with her heart? This is a book that I really enjoyed. I am currently working on several books, and you know when you are drawn to put other books down that you've found a keeper. Beyond All Measure if definitely a keeper. I enjoyed the main characters, but I really liked the secondary characters. They were not left behind while the story centered on a select few. This is a great read. This book also had a discussion guide at the end, good for personal reflection or a book club. Thomas Nelson has provided me with a complimentary copy of the ebook for review purposes.